Wettlauf nach El Dorado (Race to El Dorado, or simply El Dorado) is a new game from Reiner Knizia, the famed German designer of classics such as Tigris and Euphrates, Ra, Ingenious, Keltis, and Lost Cities. El Dorado is currently nominated for the 2017 Spiel des Jahres, where it faces Kingdomino and Magic Maze for the coveted German Game of the Year prize. At heart, El Dorado is a streamlined deck-building game in which players use cards to race across a modular map. The game is excellent–charming, simple but deep, and expandable. I’ve enjoyed it with gamers and family alike and expect it to have a good shot at winning the Spiel. El Dorado is … Dominion with a map. In brief, players start out with a small deck of cards that allow them to move forward on a map, and to purchase better cards. The goal is to be the first to reach the fabled City of Gold. The board consists of large hex-shaped tiles, made up of smaller hex-shaped spaces of several varieties. Most of the spaces have a movement cost associated with them, indicated on the space. Green spaces have one, two, or three machetes on them, blue spaces have one, two, or three paddles on them, and gold spaces have one to four coins on them. To move onto these spaces, players must play a card with at least that many matching symbols. The cards can’t be added–that is, to move onto a space with three machetes you must play a single card with at least three machetes. If the card played exceeds the cost required to access the space, the “left over” symbols on the card may be used to move onto additional spaces. The large tiles are separated by smaller “obstacle” tiles with a movement cost, paid like other spaces, with the payor collecting the obstacle to be used as an end-game tiebreaker if needed. Players cannot move onto spaces with other players, creating the potential to block each other in tight areas of the map. Some of the spaces require you discard a card rather than matching symbols (boulders), some are impassable (mountains), and some require you trash cards (basecamps). (I’ll resist a “trashing the camp” pun from Disney’s Tarzan movie.) The tiles are cleverly set up to create interesting situations in the suggested maps. For example, the penultimate tile on the introductory map has a range of mountains that spans much of the tile, with a “trash three” camp in the middle and a difficult water territory on the other side. Do you try to work through the water, or give up three cards in the middle of the tile? Does it depend on what other people are trying to do? The players have eight initial cards in their deck. Three green, with one machete each, allowing movement over green spaces, one single-paddle blue, allowing movement over blue spaces, and four one-coin gold cards, allowing movement over gold spaces and purchase of other cards. (Cards with no gold coins can be used to purchase other cards as half a coin.) There are six initial upgrade cards available to purchase, and the rest are set in stacks nearby. Once any stack of the initial upgrade cards are all purchased, a player may buy a card from any of the available stacks. That stack of cards then fills the empty spot and becomes available to purchase by all the players. These cards are a mix of better movement, “draw X, discard X,” and “draw X, trash X,” among others. Some of the better cards are one-time use and must be trashed after play. Players start with a hand of four cards, and draw up to four at the end of each turn. On their turn, players move and/or buy one additional card. The first to reach El Dorado wins, unless someone else also reaches it during the same round. The tie breaker is the number of obstacles the player collected, and if still tied, the player collecting the highest numbered obstacle wins. In the five games I’ve played, three have been decided by tie-breakers, so getting to obstacles first seems to matter. There is a two-player version, in which players control two pawns from a single hand of cards and must get both pawns to El Dorado. The game also comes with a variant in which various bonus tiles are placed on caves. Players collect the bonus tiles by moving next to the caves and can spend them on future turns for extra movement, extra card draws, and so on. I’ve enjoyed my plays of El Dorado quite a bit, just enough to tip it into “I Love It” on the Opinionated Gamers scale. I’ve played at all the player counts, on a couple of the suggested maps, and with and without the cave tiles. Each experience has been a good time. The game has some strategic depth, but isn’t overly complicated, comparable to the base game of Dominion without all the expansions mixed in. For example, my 11-year old daughter picked it up easily, but I’m sure an experienced player would crush both of us. With the variety available from different maps, I expect the game will have serious legs, especially if future expansions vary the available cards. The game rewards tactical play (how do I use this hand? ), and strategic play (how do I prepare for the bottlenecks on the next tile?). Gameplay is interactive. Blocking other players is very possible at times, and there are only three of each possible card to buy. At the same time, there are no direct attacks, such as ways to make other players discard cards or force them backwards on the map. The components and graphic design are both excellent. The map does a great job of visually cuing players to the required movement costs. The artwork is pleasant, and the tiles are good quality. My one complaint here would be that for a deck-building game, the cards are very small–I would have preferred something easier to hold and shuffle. The game is good at each player count, and I expect would be decent if expanded to include up to five players, which would be an achievement for a deckbuilder. Because there are no lengthy card combinations to work out, turns are very quick once players get a feel for the game. Finally, the two-player game is surprisingly enjoyable. I expected controlling two pawns would be clunky, but controlling both with a single hand of cards was very engaging, and the game played very quickly. I have just a couple nitpicks about gameplay. I wish there were a bit more variety in the cards. Most of the cards are simple upgrades of earlier cards (move two instead of one, three coins instead of two, etc). I appreciate that they’ve kept the game simple and fast, but I imagine more clever upgrades would be possible. I expect expansions will accomplish this. Additionally, there can be a bit of frustration factor, particularly as you’re learning the game. Some of the tiles take a bit of planning to get through, and you can get seriously stuck if you don’t have the right cards. Of course, once you learn the map there’s a feeling of satisfaction as you prepare appropriately. Overall, I expect El Dorado to be a strong contender for the Spiel des Jahres. It delivers what the best recipients of the award do– provide an enjoyable family-weight game with enough strategic depth to satisfy more experienced gamers, but not enough complexity to turn off more casual gamers. This isn’t the next Tigris & Euphrates, but it doesn’t aim to be. Highly recommended. 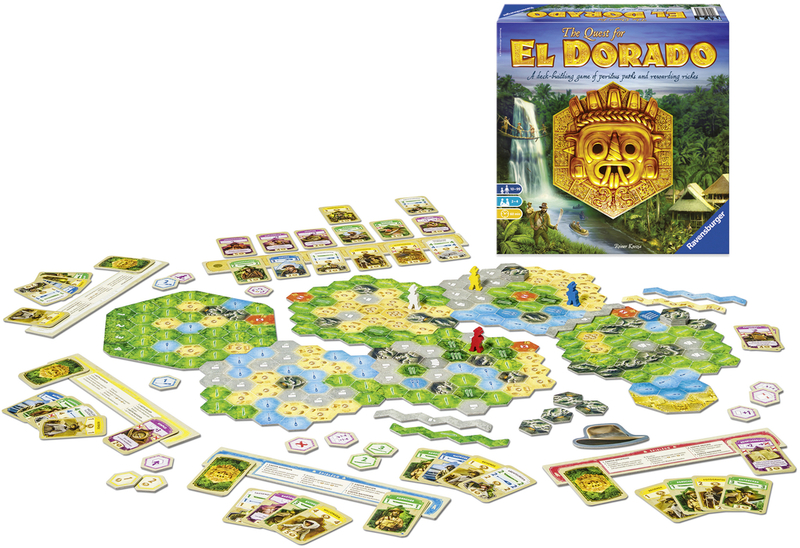 Chris Wray: With El Dorado, Reiner Knizia once again shows that he’s among the best designers in the business. I agree with Jeff: El Dorado is a strong contender for the red pöppel. The game is easy to learn, strategic, original, and well-produced, all characteristics that the SdJ jury appreciates. While I think Clank! did the race-using-deckbuilding mechanic better, I think families will prefer El Dorado due to its accessibility. Dale Y: Well, the game fell short in the race for Spiel des Jahres (the award went to Kingdomino), but this game is still a solid game. The game has worked well at all player counts that I’ve tried it at, and despite the fact that there is a fair amount of strategy involved in the game, the rules are easy to teach/learn. Given my background, I tend to like games with deckbuilding as a mechanism, and this game is no different. There is just enough here with the different cards to allow you to craft your own way. Unlike Jeff, I am not bothered by the somewhat limited nature of the cards – keeping the cards simple helps the game remain accessible to even players who are not overly familiar with deckbuilding. Even without any new cards, the game feels different enough with the varied map layouts, and I like the way that the shifting board patterns affect how you want to approach the cards. Lorna: Fun race game with some deck building thrown in. Like Trains before it, it mixes deck building with a board aspect which makes it more interesting than a standard deck builder for me. Jeff A.: When Knizia once remarked about how he avoids other designers’ games so as not to be influenced by them, I was disappointed, as I wondered aloud what new twist the veteran could give the deckbuilding genre (as he did with classic Stratego when he made Lord of the Rings: The Confrontation). I’m glad he ignored his own advice, as this is a very enjoyable family deckbuilding game. Like Lorna, I prefer a spatial element in my deckbuilders, and a racing game fits the bill. On the other hand, I haven’t felt the need to buy this as I prefer other deckbuilding games and other racing games. I wouldn’t turn down a game of this, but no one else has ever brought this to a game night, so I doubt I will have many more opportunities. Greg S: I have only played once and I was disappointed. I found the game rather pedestrian, and like Jeff I was disappointed in the lack of variance in the cards. I also found that just when one develops his deck, the game ends. However, if it went longer, it would overstay its welcome. I’d play again if asked, but feel no need to own it or seek more plays. Larry: I’ve only played this once, but was pleasantly surprised. It’s a nice little family-weight game that can still interest more seasoned gamers. It moves quickly and the deckbuilding doesn’t dominate, but you definitely need to look ahead to what tough terrain is coming up in order to succeed. I’m not sure how much variety there is, but there’s obviously a bunch of different setups possible (quite a few of which are provided in the rules), so the potential is there. It may be a backhanded compliment to say that I’m surprised when the Knizia of today delivers a solid game, but it’s a compliment all the same, so good for you, Reiner. Dan Blum (4? plays): So far I like it. I am not a big deckbuilding fan and like Lorna and Jeff I tend to prefer deckbuilding games which aren’t entirely about the deck. One could argue that not having variable sets of cards makes this a simple optimization puzzle for a given board layout, but I think there’s a bit more to it than that (especially since you can’t necessarily control when cards become available) and there are many possible board layouts. Now that I’ve tried a longer board layout I can say for sure that this has a significant effect on how you tune your deck. Jeff L.: I still have El Dorado at “I love it.” While I see why Kingdomino took home the Spiel in terms of accessibility, El Dorado is a fantastic family-weight deckbuilding game that I hope stays around long enough to see expansions. Jonathan: I liked my one play of it, but won’t be seeking it out to play or acquire. It does a ton of things very well, but even aside from the platters, it felt like Mississippi Queen + deck building to me. If a game has an adventure theme, I want an adventure feeling. I had the same issue with Adventure Land. At the same time, I don’t know how to meld the feeling of adventure with a Euro, and will leave that to Knizia and Kramer to figure out. 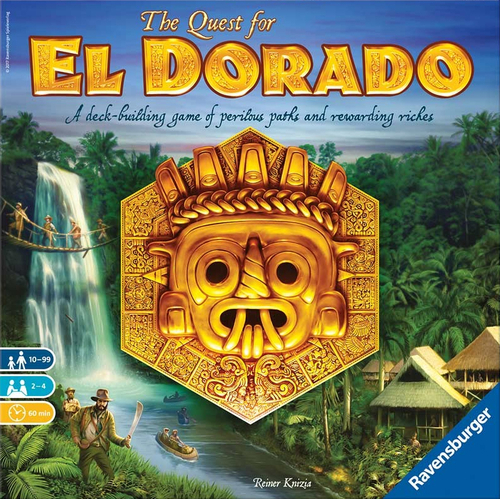 Joe Huber (6 plays): I’m definitely enjoying El Dorado and most of the Spiel des Jahres nominees this year. But at the same time – I rather suspect it’s not going to last for me. I’ll probably get to 10 plays, definitely getting my money’s worth from the game, and my best guess is that I’ll remain happy to play the game beyond that – but I’m not convinced that I’ll need to have it in my collection. James Nathan (1 play): While I’m drawn to racing games, I don’t usually end up enjoying them. In El Dorado, I found some of the specific ways that deckbuilding was implemented sufficient to overcome my race game weariness. Specifically, the Dominion pool-but-with-a-futures-market approach to the available cards introduced some interesting choices regarding when to unlock a new card and which one. I generally prefer fewer types of currency in my deckbuilding games, yet I found it interesting how you needed the different terrain types in differing amounts throughout the game and the accompanying steps of planning your path and overcoming opponent blocking (There’s no pivot-to-VPs moment). As someone who aggressively trashes in deckbuilding games, those hexes and painfully placed, and the opportunity cost was visually stark. Mitchell Thomashow (6 plays): This is a light-hearted, colorful, route planning game, and it should not be assessed as deep or studious. The deckbuilding is clever, if unoriginal, but creates an amusing marketplace of possibilities. Like many of Knizia’s family oriented games, there are enough decisions involved so that skill and experience are rewarded, but not so much that it inhibits newcomers. I enjoy games like this. El Dorado is fun to play, quick to set up, and pleasing to behold. It is nice to see us talking seriously about a Knizia game again. I also really enjoy this game, and yeah it really could have legs with expansions. Yet it does seem to be missing some sort of spark I can’t quite put my finger on. A Knizia game where you feel the theme! We’ve loved our plays of this.